A man opposite me shifted his feet, accidentally brushing his foot against mine. It was a gentle touch, barely noticeable, but the man immediately reached out to touch my knee and then his own chest with the fingertips of his right hand, in the Indian gesture of apology for an unintended offence. In the carriage and the corridor beyond, the other passengers were similarly respectful, sharing, and solicitous with one another. At first, on that first journey out of the city into India, I found such sudden politeness infuriating after the violent scramble to board the train. It seemed hypocritical for them to show such deferential concern over a nudge with a foot when, minutes before, they'd all but pushed one another out of the windows. Now, long years and many journeys after that first ride on a crowded rural train, I know that the scrambled fighting and courteous deference were both expressions of the one philosophy: the doctrine of necessity. The amount of force and violence necessary to board the train, for example, was no less and no more than the amount of politeness and consideration necessary to ensure that the cramped journey was as pleasant as possible afterwards. What is necessary! That was the unspoken but implied and unavoidable question everywhere in India. When I understood that, a great many of the characteristically perplexing aspects of public life became comprehensible: from the acceptance of sprawling slums by city authorities, to the freedom that cows had to roam at random in the midst of traffic; from the toleration of beggars on the streets, to the concatenate complexity of the bureaucracies; and from the gorgeous, unashamed escapism of Bollywood movies, to the accommodation of hundreds of thousands of refugees from Tibet, Iran, Afghanistan, Africa, and Bangladesh, in a country that was already too crowded with sorrows and needs of its own. The real hypocrisy, I came to realise, was in the eyes and minds and criticisms of those who came from lands of plenty, where none had to fight for a seat on a train. Even on that first train ride, I knew in my heart that Didier had been right when he'd compared India and its billion souls to France. I had an intuition, echoing his thought, that if there were a billion Frenchmen or Australians or Americans living in such a small space, the fighting to board the train would be much more, and the courtesy afterwards much less. And in truth, the politeness and consideration shown by the peasant farmers, travelling salesmen, itinerant workers, and returning sons and fathers and husbands did make for an agreeable journey, despite the cramped conditions and relentlessly increasing heat. Every available centimetre of seating space was occupied, even to the sturdy metal luggage racks over our heads. The men in the corridor took turns to sit or squat on a section of floor that had been set aside and cleaned for the purpose. Every man felt the press of at least two other bodies against his own. Yet there wasn't a single display of grouchiness or bad temper. However, when I surrendered my seat for four hours of journey, to an elderly man with a shock of white hair and spectacles as thick as lenses on army scout's binoculars, Prabakar was invoked to indignant exasperation. "So hard I fought for your seat, Lin. Now you give it up, like a spit of paan juices, and stand up in the passage, and on your legs, also. " "Come on Prabhu, He is an old guy. I can't let him stand while I sit"
"That is easy - only you don't look at the old fellow, Lin. If he is standing, don't look at him standing. That is his business only, that standing, and nothing for your seat"
"It's the way I am", I insisted, laughing self consciously in the conversation he was directing across the whole carriage of interested fellow passengers. "Such scratches and bruises I have it on my bodies, Lin", he whined, talking to me but appealing to the curious gallery. He lifted his shirt and singlet to display what was indeed a rough scratch and gathering bruise. "For this old fellow to put the left side buttocks on the seat, I have these many scratches and bruises. For him to put his two-side buttocks on the seat, I am all bruising and scratching on my bodies. This is very shame, Lin. That is all I am telling you. It is a very shame." 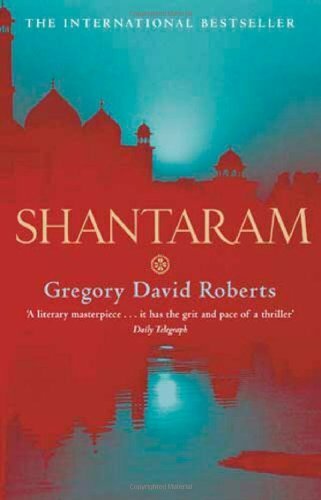 Staged in India of 1980, Shantaram is a book based on Gregory David Roberts' experiences in India. A heroin addict and convicted bank robber in Australia, Gregory flees from prison to India. The novel is a portrayal of author's life in Mumbai (then Bombay), India.